Frequently on the F This Movie podcast, we bemoan the lack of quality children’s films. If your children have never seen Cats Don’t Dance (1997), why not watch it with them? This film apparently went through pre-production hell. It started out in 1993 as a vehicle for Michael Jackson and the Looney Tunes. Jackson would appear in the film live, with the beloved Looney Tunes characters animated. When Jackson dropped out, Warner Bros. instead used the Looney Tunes gang, along with a live-action Michael Jordan, in the 1996 movie Space Jam. With new characters and a now fully-animated protagonist, Cats Don’t Dance was finally released in 1997 as the first and only production of Turner Feature Animation -- right before Ted Turner merged his media empire with Warner Brothers. The film’s release suffered in the corporate transition, and when it was finished, the studio dumped it. Cats Don’t Dance wound up costing more than $35 million; it made back less than $4 million at the box office. The loud and unwatchable Space Jam grossed more than $250 million. 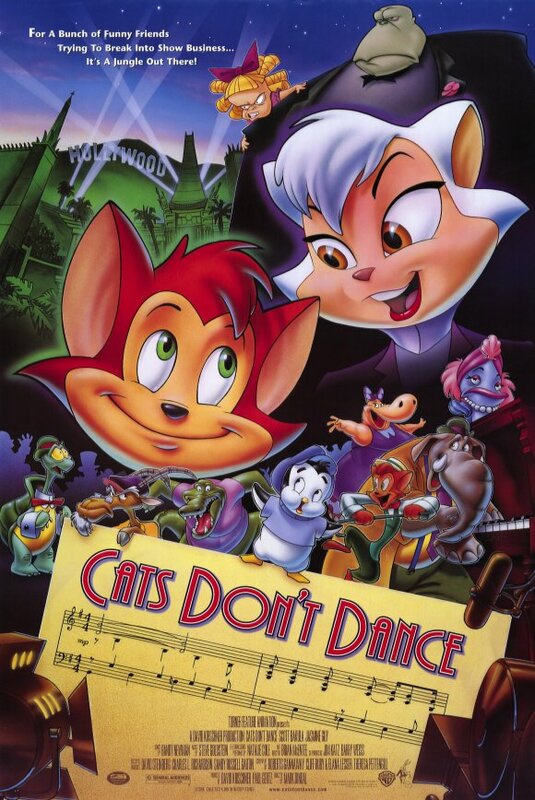 This is a shame because Cats Don’t Dance is THE undiscovered animated gem of the last two decades. Gene Kelly consulted with the animators on the choreography, making this the last film on which Kelly ever worked. Cats Don’t Dance was the first non-Disney film to win the Annie Award for Best Animated Feature, years before the AMPAS made that an official Oscar category. THE PLOT IN BRIEF: In 1939, Danny the Cat arrives in Hollywood from Kokomo, Indiana. His plan? According to his “To-Do List,” he is going to become a big movie star. He gives himself a week. After snagging a part in a Noah’s Ark-inspired musical extravaganza, Danny learns the Hard Hollywood Truth: child star Darla Dimple holds such sway at the studio and her hatred of animals is so great that animals are not allowed to sing and dance. At Mammoth Pictures, animals are little more than extras. Danny will not accept that reality and sets out to prove to studio head L.B. Mammoth that animals have much more to offer. Along the way, he gathers together a literal menagerie of talented friends. - Cats Don’t Dance has enough visual invention for three conventional films. Recently on an F This Movie! podcast, I wondered what had ever happened to ancillary bits of “business” in narrative movies. Everywhere you look in the frame in Cats Don’t Dance, there is something going on: visual gags, running jokes (my favorite involves an unoffended pig), and amazing period detail. The pace of this film is frenetic, and I would almost say you have to see it twice just to take in all the gags. AND ALL OF THE PEOPLE DROWNED. Also, manservant Max is so much bigger than the diminutive Darla that it leads to some of the film’s best gags based on scale. As my astute son pointed out during a recent viewing, so much of the film’s visual motifs are based on the gaping disparity between large and small. This is a film that plays with a very big canvas. 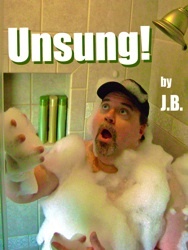 - Check out this voice cast! Although most people probably remember Scott Bakula from Quantum Leap, he voices Danny here and does all his own singing. Jasmine Guy is suitably sweet as the female lead, though her singing is handled by Natalie Cole. The rest of the voice cast is a deep bench of beloved character actors, many of whom had never voiced an animated character before: John Rhys-Davies, George Kennedy, Kathy Najimy, Hal Holbrook, Don Knotts, and David Johansen. Director Mark Dindal even contributes as the formidable voice of Max. This is the kind of film that children need to see: smart, but sweet. This is the kind of film that F-Head children need to see: full of sly references to classic Hollywood. Cats Don’t Dance also explodes with a kind of joy that is sorely lacking in most contemporary children’s films. Cats Don’t Dance (like the equally delighful Ratatouille) insists that you should never let other people define you. That is a message that our children need to hear again and again and again. Great stuff JB. Too bad most people my age are in denial about Space Jam. Space Jam sucked and so did Hook. Deal with it. As an animation buff I would really enjoy an animated FThisMovie podcast. Maybe Pinocchio or Princess Monoke? Cats Don't Dance did have ts share of problems, but the development hell award goes to Richard Williams The Thief and The Cobbler. Wasn't the biggest problem test audiences who thought "cobbler" meant "moist cake with peaches" and so left the screenings disappointed and confused? I had similar reaction after watching the Apple Dumpling Gang. I remember when this movie came out. I was working at a Subway sandwich shop and our Kids' Meal toys were always from some second-tier property. It never would have occurred to me that this was actually a quality film or that someone would be recommending it 15 years later. I had the exact same reaction, Darren! I dismissed this as "not Disney" 15 years ago and haven't thought of it since. And now I HAVE TO SEE IT. This column is definitely working. I would never in a million years have watched this movie before reading this column. I had assumed it was dollar store fodder and avoided it at all costs. Now I'm eager to watch this with my kid because quality children's movies don't come along that often and because if I have to sit through another half hour Disney channel show like A.N.T. Farm or Shake It Up I'm going to scream. Darren, that is so great that you brought that up. When I was researching this week's film, I discovered that the only toys available for Cats Don't Dance were at SUBWAY. What a memory!